ElectricVLab has two modes of operation, Build and Simulation. 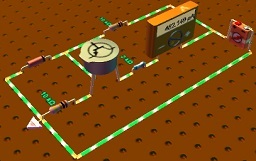 In Build mode, you build your circuit by placing components on a virtual breadboard and connecting them with wires. Simulation mode is where you see the circuit in operation. In this mode, you can see the circuit coming to life: Lamps glow, fireworks happen, instruments display the values, wires animate to indicate current flow and so on. You can also do things like toggling the switches or changing the parameters of the components and see how the circuit responds. There are over 120 different types of components to choose from when building your circuit. Both analog and digital electronics components are available. You can customize most of these components by tweaking their parameters. For example, by changing the color parameter of the bulb, you can create a bulb of any color you want. Thus, by tweaking the parameters of the core components provided, you can effectively create countless number of functionally different components. 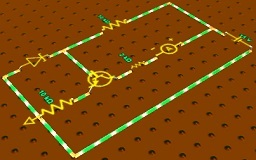 You can work on the circuit in 3D view (above) OR 2D circuit diagram view (below). By the way, the images here also illustrate one of the many customizable options, that of circuit board color. ElectricVLab has oscilloscope, voltmeter, ammeter, ohmmeter, and spectrum analyzer components. They display their values in real time. 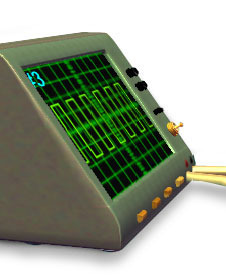 The oscilloscope component displays the waveform on its screen. In addition, by clicking on the oscilloscope while in Simulation mode, you can bring up an enlarged display of the waveform. This enlarged display also provides several other functionalities normally found in oscilloscopes such as changing the horizontal or vertical scale, specifying trigger value/slope, setting cursors etc. In addition to the virtual instruments, there are many other visual feedbacks about circuit operation. Just by mousing over the wires and points on the circuit, you can view the current and voltage values there at that moment. The speeds at which the wires animate indicate how much current is flowing through them. Visual effects show fuses or bulbs burning out when their ratings get exceeded. The rate at which rockets fire out of fireworks components, the quantity of water squirting out of a water jet etc. depend on the voltage/current values. Quite a few of these visual feedbacks are customizable as well. ElectricVLab has the ability to communicate with the Arduino board plugged into the USB port of the computer. 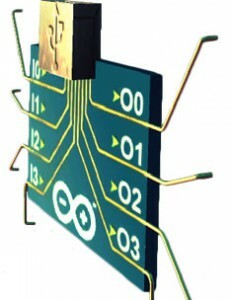 Effectively, the virtual circuitry built in ElectricVLab can be connected to the Arduino board. This provides many benefits for Arduino users. A very simple example would be that of using the virtual oscilloscope of ElectricVLab to view a signal on the Arduino board. 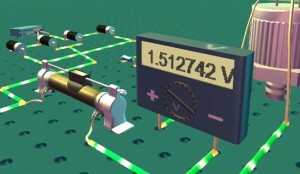 More generally, there are limitless possibilities as to what can be accomplished by connecting the virtual circuits built in ElectricVLab to the Arduino board. Read more. and save them as your own. These pre-built circuits have been chosen so as to provide a walk through the core concepts and components of electronics. So, in a way, they collectively can be thought of as a book on electronics with the difference that in this case, instead of reading, you learn by interacting with these circuits. In addition to a wide collection of actual analog and digital electronics components, some fancy components have also been added in ElectricVLab to provide a touch of playfulness. There are currently 11 fireworks components producing different kinds of fireworks. There is a robot and also some components that produce visual effects like flame, fountain etc. 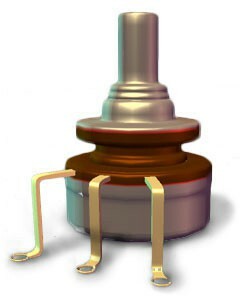 These components help to provide visual indications of circuit operation. For example, the rate at which rockets shoot out of a fireworks component corresponds to the amount of current flowing through it. The electronic circuitry can be used to sequence the different fireworks or other visual effects to create interesting overall effects. ElectricVLab is customizable in so many different ways. For example, the color of the circuit board itself can be changed to something you like. For any circuit, there is a way to attach informative notes such as what the circuit does, how it works or whatever you want. This can be useful for your own reference or for pedagogical purposes. There are options to save the screenshots of circuits and waveforms. One can also export a Bill of Materials listing the types and corresponding counts of the components used in a circuit.